Unprepared. Uninspired. Unorganized. Undisciplined. That's my un-Take for this unsightly loss to the lowly Browns. The lack of composure wasn't limited to the players. On first and goal at the two-yard line with plenty of time to mount a comeback, our offensive coordinator went with an empty backfield (! ), resulting in an incompletion. Then we passed the ball again. And again. And again. Ummm...Michael Bush is averaging five yards per carry this season (including during this game). We were playing one of the worst run defenses in the NFL. Yet we pass the ball four straight times from the two-yard line? Meanwhile, two players were ejected amid a hail of 13 penalty flags. I don't want to hear about how the zebras are out to get us, how the other team started it, blah, blah, blah. Get over it. Say the zebras are out to get us? Then accept it and adapt to it. Don't make it worse. I'm sick of the excuses. The zebras don't false start. The zebras don't drop balls. The zebras don't get sacked on crucial downs. We have seen the enemy, and the enemy is us. How can Bush not get a carry in this game after the 35-minute mark? Against the Browns' poor run defense? With Charlie Frye struggling? How can the Browns' top running back run the ball four more times than ours? They saw Derek Anderson and planned their game accordingly. We saw Charlie Frye and hallucinated Daryle Lamonica. If Bush is in the doghouse, then give him some dog food. But if he's going to play, then freakin' play the guy. He's averaging five yards per carry despite having had no consistency in his workload. Against the Chiefs, Bush averaged 8.5 yards on 14 carries, and we rewarded him the next week with four carries (on which he gained 6.8 yards on average). His carries then went down to three, one and then none in the subsequent three games. Then he busts loose with 7.4 yards per carry on 18 rushes against the Broncos, only to be abandoned today after 35 minutes of play against one of the NFL's worst rush defenses. I have nothing more to say right now. Thank you for listening. Out. Two weeks ago, after the victory over the Steelers, I observed that the Raiders actually displayed some swagger, something we hadn't seen for a long time. Now I'm sensing something else that's been a long time coming: character. Do you realize that if DHB doesn't let the ball bounce off his concrete mitts against the Chiefs, we would be looking at four last-minute victories in the past six games? Crikey, that's amazing. As it stands, three last-minute victories out of the last five games is still pretty impressive. Have you ever seen a more Jekyll-and-Hyde season than this one? We open with a strong showing against the Chargers and a victory over the Chiefs on the road, followed by three embarrassing blowouts, followed by a shocking win over the Eagles, then three more utter embarrassments before going on this 3-2 run of thrilling victories interrupted by untimely incompetence. Let's not understimate the potential impact of these last two games. If we win one of them, we will notch our higest victory mark since the Super Bowl season of 2002. I won't lie: I didn't see this coming. Honestly, I'm not sure what my take is right now. This season had all the earmarks of an utter debacle. And then a funny thing happened, we found our mojo at the most unexpected time, in the twilight of a lost season marred by angst and scandal. Are we finally for real, or is it a cruel mirage? Who is this team? First off, thanks to Doobie for creating and sharing this awesome graphic of Bruce Gradkowski. 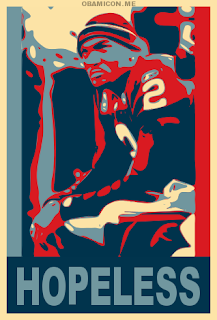 Sadly, while Doobie sent this graphic to me last week, I only discovered it in my email today, after the Gritmeister blew out his knee, leaving us rather hopeless at the QB position. Ah, cruel irony. Hey, Doobie, can you make one of JaMarcus Russell? You'll only have to add one word: no. As in, No Hope. 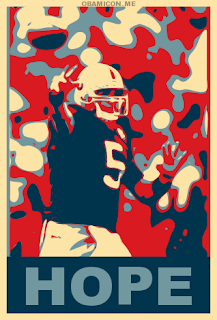 Indeed, with Gradkowski out, we seem poised to circle the drain for the remainder of the season. Unless we win two out of our remaining three games, we will have extended our NFL record for most consecutive seasons of 11 or more losses. 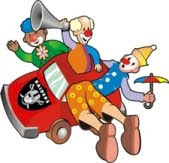 I was going to break out the clown car, but I will refrain, based on the competitive first half of the game. I'd call yesterday a half of a clown car game. That's a total of 6.5 clown car games so far this season (the Cowboys game was one, even though I didn't post the clown car after it). That's a lot of clown car games. In fact, it's exactly 50 percent of our games to date (13/2 = 6.5). 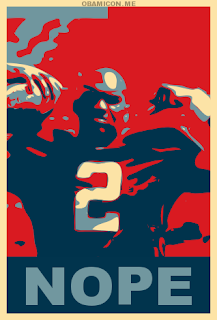 In my opinion, our new year should begin with a GM hiring and a new head coaching search. Dare I hope for that?